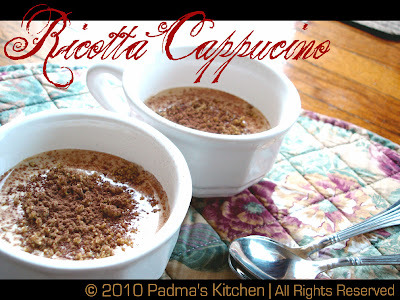 As the name says it is an easy Italian Dessert, adapted from Giada's version. I love cooking Italian food and when it comes to desserts, I love Giada's recipes most. 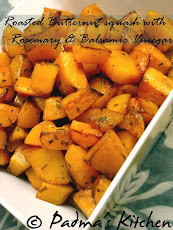 I made this for the first time last year and It was an instant hit!!! It was super easy and delicious. And since then we have been making it quiet often. I forgot to post it on my blog, so this time when I made it, I took some pictures to post on my blog. I promise that you will definitely like it and will make it again and again and again!! Take sugar, ricotta cheese in a food processor, pulse it so that the sugar and cheese are fairly blended together. To this mixture add vanilla extract and espresso powder (Indian brand instant coffee powder like Bru or Nescafe) and blend it for one min. Stop the machine and scrape down the sides of the with a rubber spatula. Blend for another minute. Spoon the mixture into 4 small coffee mugs. Cover and refrigerate for at least 1 hour and up to 1 day. 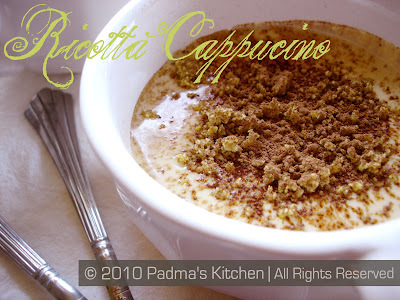 To serve, top the ricotta cappuccino with crushed pistachios. Sprinkle with cocoa powder. DH is kinda addicted to this recipe and loves to make it when I am not in a mood to prepare any dessert. This easy to make dessert is my DH's favorite one. He always makes this when we have potluck or when there is GUYS only cooking event. Children also love eating it and its healthy too, if you minus the cappuccino from the recipe. Great looking and irresistible cappucino..
Wow an awesome idea..lovely combo! I can drink cappucino at any time. One of my fav drink. Love the click and I feel like a drinking a cup of it now. Padma's Kitchen turned 3, today! !